Glioblastoma multiforme (GBM) is the commonest primary brain tumour in adults characterized by relentless recurrence due to resistance towards the standard chemotherapeutic agent temozolomide (TMZ). Prolyl 4-hydroxylase, beta polypeptide (P4HB), an endoplasmic reticulum (ER) chaperone, is known to be upregulated in TMZ-resistant GBM cells. MicroRNAs (miRNAs) are non-protein-coding transcripts that may play important roles in GBM chemoresistance. We surmised that miRNA dysregulations may contribute to P4HB upregulation, hence chemoresistance. We found that miRNA-210 (miR-210) was P4HB-targeting and was highly downregulated in TMZ-resistant GBM cells. Forced overexpression of miR-210 led to P4HB downregulation and a reduction in TMZ-resistance. A reciprocal relationship between their expressions was also verified in clinical glioma specimens. Our study is the first to demonstrate a potential link between miR-210 and ER chaperone in determining chemosensitivity in GBM. The findings have important translational implications in suggesting new directions of future studies. Glioblastoma multiforme (GBM), a World Health Organization (WHO) Grade IV glioma, is the commonest and most malignant form of primary brain tumour [1-3]. 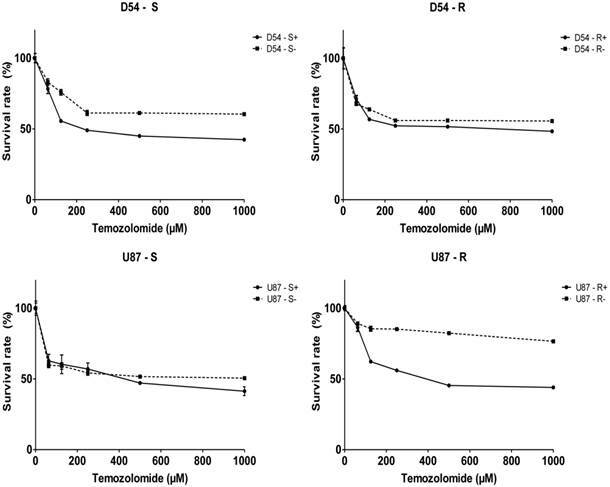 GBM is highly invasive and refractory towards the standard chemotherapeutic agent temozolomide (TMZ), resulting in high recurrence and mortality rates . Prolyl 4-hydroxylase, beta polypeptide (P4HB) is a chaperone protein of the endoplasmic reticulum stress response (ERSR) pathway. While its normal function is to prevent unfolded protein aggregation, P4HB has also been found to prevent chemotherapeutics-induced apoptosis in cancer cells [5, 6]. Indeed, our group have previously identified P4HB to be highly expressed in TMZ-resistant GBM cells . This conferred TMZ-resistance by suppressing the activation of the downstream ERSR pathway that would otherwise induce apoptosis . MicroRNAs (miRNAs) are small, non-coding RNAs about 22 nucleotides long. They regulate gene expression post-transcriptionally by binding to the 3' untranslated region (3' UTR) of the target genes and cause messenger RNA (mRNA) degradation and/or translation inhibition [9, 10]. Dysregulated miRNA expressions are found in various cancers and are intimately involved in cancer progression . Hypoxia is an important inducer of ERSR in GBM and is also commonly associated with miRNA dysregulation. For instance, miR-210 is consistently upregulated under hypoxia and highly dysregulated in GBM, but its role in GBM chemoresistance has not been studied [12, 13]. Interestingly, miR-210 is also known to target P4HB . We therefore conducted the present study to investigate whether and how miR-210 may interact with the ERSR pathway, in particular its chaperone protein P4HB, in affecting GBM response to TMZ. The hypothesis was that miR-210 would be downregulated in TMZ-resistant cells and that its upregulation would improve chemoresponsiveness. Two human GBM cell lines were used: D54-MG (a gift from Duke University Medical Center, Durham, NC, USA) and U87-MG (American Type Culture Collection, Manassas, VA, USA). D54-MG cells were cultured in Dulbecco's Modified Eagle's Medium (DMEM)/F-12, and U87-MG in Minimum Essential Medium (MEM) α, all of which were supplemented with 10% fetal bovine serum (FBS) and 1% Penicillin-Streptomycin (PS) (all from Gibco® by Life Technologies, Grand Island, NY, USA). Both cell lines were cultured in a 37°C humidified incubator with 5% CO2. Isogenic TMZ-resistant subclones D54-R and U87-R were derived after chronic exposure of the parental cells D54-S and U87-S to TMZ (Temodal; Schering-Plough Corporation, Kenilworth, NJ, USA) as previously described . Clinical tumour samples were collected from patients who had undergone initial surgical resection before chemo-irradiation and adjuvant TMZ treatment. Tissues of WHO grade II to IV, confirmed by a neuropathologist, were used. The study was approved by the Institution Review Board of our institution and signed consent forms by patients or their legal guardians were obtained. Relative expression levels of miR-210 and P4HB in vitro and in clinical specimens were quantified by qPCR. MiRNA and total RNA were extracted using the TRIzol® Reagent (Ambion® by Life Technologies, Austin, TX, USA). Purified miRNA and RNA samples were reverse-transcribed using miScript® IIl RT Kit (Qiagen, Venlo, Limburg, Netherlands) before qPCR amplification using miScript SYBR® Green PCR Kit (Qiagen) with the 7900HT Fast Real-Time PCR System (Applied Biosystems, Inc., Foster City, CA, USA). MiRNA and mRNA expression levels were normalized to U6 small nuclear RNA (snRNA) and GADPH as internal controls, respectively, and were expressed as relative fold ratios. Transient transfections to achieve miR-210 overexpression were conducted on 6-well plates at an initial density of 2.5 x 105 cells per well. At near confluence, cells were treated with Lipofectamine® RNAiMAX Reagent diluted with either mirVana™ miRNA mimic (which overexpresses miR-210) or mirVana™ miRNA mimic Negative Control (as negative control) (all from Ambion®). Cell proliferation was measured using the 3-(4, 5-Dimethylthiazol-2-yl)-2, 5-diphenyltetrazolium bromide (MTT) assay (Sigma-Aldrich Corporation, St Louis, MO, USA). Cells were seeded onto 96-well plates at an initial density of 5000 cells per well and were cultured for 24 hours. Culture media were changed serially to reach various concentrations of TMZ (i.e. 0, 62.5, 125, 250, 500, 1000, 2000, and 3000 μM). Cells were collected and the optical densities (OD) were measured at an absorbance wavelength of 595 nm. The amount of cells viable relative to controls was calculated and the half-maximal inhibitory concentrations (IC50) were derived. Experiments were performed in triplicates. Data analysis was performed using the Prism (version 6.0) software (Graphpad Software, Inc., La Jolla, CA, USA). Statistical significance was determined using student's t-test and p-value < 0.05 was considered statistically significant. 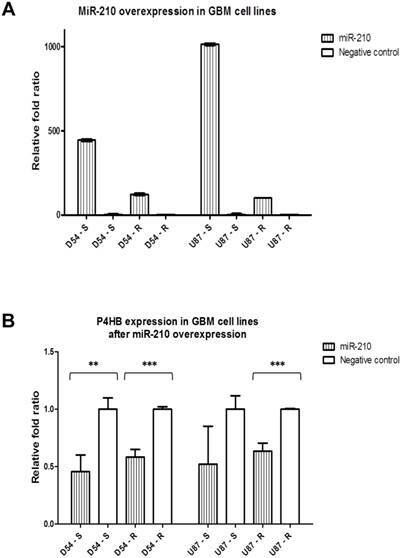 To verify the involvement of P4HB in GBM chemoresistance, and that miR-210 would be its potential regulator, their intrinsic expressions were quantified. As expected, P4HB expression was upregulated in the TMZ-resistant cells D54-R and U87-R by approximately 6-folds and 5-folds, respectively, when compared with the parental cells D54-S and U87-S (Fig. 1A). Conversely, the TMZ-resistant D54-R and U87-R cells expressed lower levels of miR-210 in comparison to their TMZ-sensitive counterparts by 2-folds and 10-folds, respectively, suggesting that P4HB may potentially be under the regulation of miR-210 (Fig. 1B). P4HB expressions were positively correlated with increasing tumour grades. P4HB expression was the highest in grade IV glioma at approximately 150-folds, followed by grade III at 100-folds, when compared with grade II tumours (Fig. 2A). 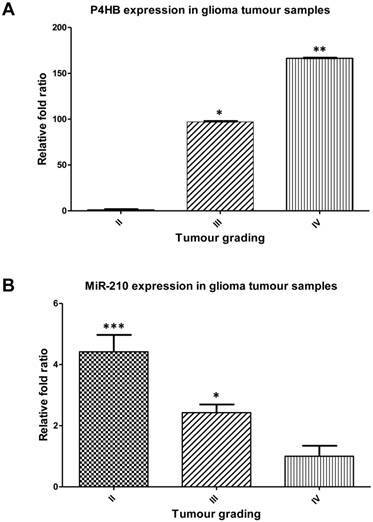 In contrast, miR-210 expressions were negatively correlated with that of P4HB in clinical glioma tumour samples. MiR-210 was the highest in grade II gliomas at approximately 4.5-folds, followed by grade III at approximately 2.4-folds, when compared with grade IV gliomas (Fig. 2B). We then overexpressed miR-210 to evaluate its potential regulatory action on P4HB. The transfection efficiency of the miR-210 mimic was confirmed by qPCR, which showed an increase in relative fold ratios by 100 times when compared with control (Fig. 3A). Due to the intrinsically higher expression of miR-210 in the TMZ-sensitive cells, the absolute levels of miR-210 expression were higher in the parental D54-S and U87-S cells when compared to their resistant counterparts. P4HB expressions at the mRNA levels were then determined after miR-210 overexpression. The latter caused P4HB downregulation by at least 2-folds when compared with negative controls in all four cell lines (Fig. 3B). Of note was that the absolute levels of P4HB expressions in the TMZ-resistant cell lines D54-R and U87-R remained higher in comparison to those of their respective TMZ-sensitive lines, due to the intrinciscally higher expression in the former group . With its effect of downregulating P4HB expression, we then examined whether miR-210 overexpression would diminish TMZ-resistance using the MTT cell proliferation assay (Fig. 4). Except for U87-R, the IC50 of TMZ for cells transfected with negative controls was around 2000 μM. With miR-210 overexpression, the IC50 was reduced to about 200 μM and 500 μM for the D54-S and U87-S cells, respectively, and at about 500 μM and 600 μM for the TMZ-resistant D54-R and U87-R cells, respectively. The overall findings were consistent with the suggestion that P4HB would confer TMZ resistance in GBM, and that miR-210 overexpression may downregulate P4HB expression, resulting in greater response to TMZ cytotoxicity. The ERSR chaperone protein, P4HB, contributes to chemoresistance in GBM cells . The current study explored miRNA interference as a potential therapeutic approach to downregulate P4HB expression for the potential restoration of chemosensivity in GBM towards TMZ. We found that miR-210 overexpression could achieve that in vitro in two commonly used cell lines. Interestingly, miR-210 is also widely reported to be an oncogene that is upregulated in various types of cancers, especially where intratumoural hypoxia is common . Our approach of using miR-210 overexpression to improve chemosentivity may therefore appear counterintuitive. It must be emphasized, however, that increased miR-210 expression was also found in non-malignant conditions, where hypoxia would be mild such as the placenta of pre-eclampsia patients. This has raised questions about the actual contributions of miR-210 towards tumour aggression, as miR-210 overexpression may simply be a consequence of tumour hypoxia [16-18]. Moreover, miR-210 has been found to be downregulated in other neoplasms such as ovarian cancer, either due to decreased expression or genomic deletions [19, 20]. Repression of tumour cell growth initiation by miR-210 in human head and neck, as well as pancreatic cell lines has also been reported, suggesting that miR-210 may potentially possess tumour suppressive characteristics as well as oncogenic effects . In fact, previous studies have reported miR-210 to be associated with favourable prognostic outcomes. McCormick et al found the expression of miR-210 in clear cell renal cell cancer (CCRCC) to be associated with reduced proliferation, lower tumour grading, lower staging, and better patient survival, possibly due to the suppression of the von Hippel-Lindau (VHL) gene . The initiation and progression of cancers depends on the expression of a wide variety of genes and their involvement in different cellular pathways. Each miRNA may have many different mRNA targets, and therefore can affect cellular processes in different cell types differently. Similarly, miR-210 may target many genes that are involved in angiogenesis, cell proliferation and/or survival, and DNA damage repair . To our knowledge, our study is the first to describe the interactions between the ERSR and miR-210, and the latter's potential effect on chemoresponsiveness. Although miR-210 is widely known for its oncogenic effects, our findings provide a novel direction for future investigations. The latter may focus on the use of miRNA interference in the treatment of chemoresistant GBM in vivo. Important considerations include the effective delivery of miR-210 inhibitor and target specificity. 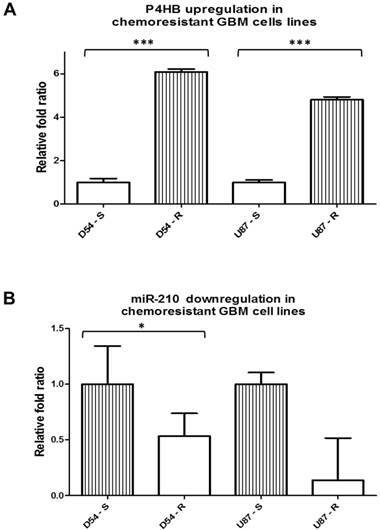 MiR-210 upregulation may reduce chemoresistance in GBM cells. A decrease in IC50 of TMZ for cells with miR-210 overexpression (“+”) relative to its respective negative controls (“-“) in all four GBM cell lines used by MTT cell proliferation assay. MiR-210 is commonly dysregulated in various cancers and serves as a useful prognostic biomarker. Our study demonstrated that miR-210's inhibitory effects of P4HB could potentially reverse TMZ-resistance in GBM cells. Both ERSR and miR-210 are known to affect malignant phenotypes in GBM. Our study is the first to demonstrate a potential link between them in determining chemosensitivity in GBM. The findings have important translational implications in suggesting new directions of future studies for the treatment of chemoresistant GBM.